Didn’t you start a business for the freedom that comes with owning your own company? After analyzing more than 40,000 businesses, it has been proven that companies achieving a Value Builder Score of 80+ receive offers that are 71% higher than the average business when it’s time to sell. In fact, we’ve seen examples of businesses that are worth two or three times that of a similar business in their industry because they have structured their operations to attract acquirers. Your company has attributes that you may not have fully tapped into yet. Attributes that will increase your bottom-line and help your business reach its full value. Using our methodology for evaluating a company, you will discover which areas of your business you should focus on in the short term to produce the best long-term results. Doctors check your blood pressure because it is one of the simplest ways to discover heart disease without an invasive and risky procedure. Similarly, The Value Builder Program evaluates your business as it stands today and then gives you proven step-by-step tools to increase your company’s worth and increase your current profits. Perhaps the best reason of all is that the Value Builder System gives you back the one element most entrepreneurs lack – TIME. No one wants to buy a business if all the value lies in the owner/entrepreneur being there. You must detach yourself from working “in the business” every day and fully take on the role of a CEO. This program will allow you to take the reins of a growing business fully. The Value Builder system will help you achieve the freedom to go to the office daily or spend time away for weeks and even months, while still knowing what is going on in the business and continuing generating profits. 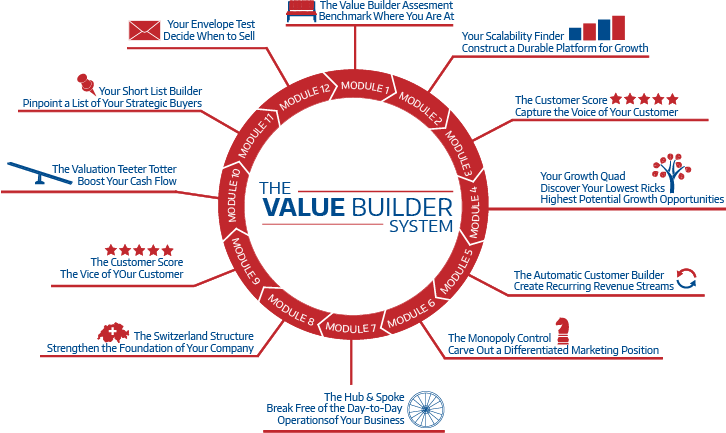 The Value Builder System is designed to be the basis of an ongoing coaching and consultative relationship. 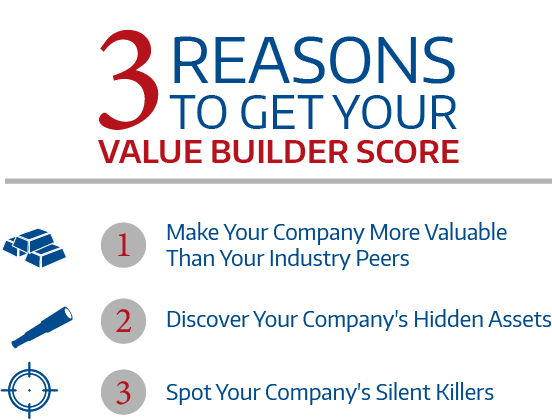 It begins with you taking the Value Builder Questionnaire to receive your Value Builder Score. Then you and one of our certified Value Builder Advisors will meet monthly for an analysis of your ongoing performance compared to the 8 key drivers of value. Monthly, your advisor will assign a different exercise for you to complete. Each year thereafter, you will complete a new Questionnaire to track the increasing value of your company.